Hello, my name is Dean and this is my first time reviewing a game on this website. Today I shall be reviewing a game that I believe many more people have enjoyed than are willing to admit it. 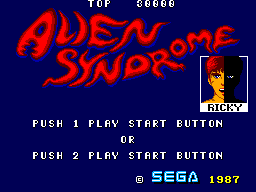 The game is known as Alien Syndrome. I have to say that it was back in 1988 I first got my hands on this game, having spent far too many coins playing it in the arcades. Initially I was slightly disappointed with the Master System conversion due to the mediocre graphics. This however was quickly forgotten as I got into the awesome gameplay - but there I am getting ahead of myself, first I'll tell you what the little story for the game is. 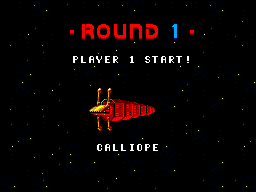 You are a soldier from planet earth and have been sent to rescue your comrades who are being held hostage on 7 different alien ships. According to the box text the aliens "shoots first and asks no questions" - but you have to wonder what makes them say this since the aliens have taken hostages rather than just killing your comrades? Perhaps I am analyzing this too much. It has to be said that there is nothing especially unique about the gameplay. I'm sure the "explore alien ships while rescuing hostages" has been done a million times before. Alien Syndrome, however is slightly different. It has a good top-down view and this gives you a good view of the action. At first glance the game appears to be a Gauntlet clone set in space. But this is totally different. You have to save a set number of hostages on each space ship and then escape. You can have one of 3 diferent types of weapons, theres a normal rifle (pea shooter) a Fireball gun (best) and a Lazer gun (sucky) but you lose each gun if you die, which makes it difficult for having a gun on bosses if you're back to the pea shooter. After finding sufficent hostages you must battle with the usual end of level guardian. The guardians are all well thought out and artisticly pleasing. The graphics for the game itself are very simple. The sprites are all of a good size and enemies look fairly good. Some of the enemies look a bit silly though. Especially the first level in which they look like Jawas from Starwars. The levels are not very detailed and each ship seems to use the same graphics for walls and floors over and over. Its not really very pleasing to the eye. The top-down view can also be a little frustrating at times too, because there are pitfalls on the ground and they can be hard to distinguish from the normal floor. The end of level bosses though are another matter, fantastic graphics. Each one totally unique and pulled from the dark recesses of a Sega game designers head, totally worth playing just to see how crazy each boss looks. This is a major problem in this game. There is no music for levels at all. There is a "bleep-bleep" noise that goes all the way through the level which is supposed to be a countdown to the ship exploding. I think it was supposed to add tension to the game, but it didn't really work very well. 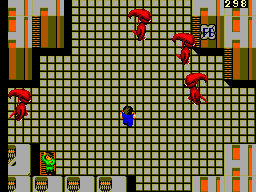 Once you collect enough hostages the music suddenly picks up and sends you off in a panic to find the exit. This is pretty cool I think. Each end of level guardian also has the same music, it's pretty cool I guess, but not great. The controls are very simplistic for this game, the D-pad moves you in 4 directions (you cannot walk diagonally) and Button 1 fires your gun. Button 2 takes you to a screen and shows you how many hostages you need to collect. I find the controls very frustrating that you can only walk in 4 directions and also a bit too "loose" as its so easy to walk off a ledge and die. I have owned this game for a long long time and I am quite angry to say to you that I still have not yet completed this game. It has to be one of the most difficult games ever made. This alone means the replay value is very high. I keep coming back for more, but also because of the steep learning curve it is a game that I only play now and again, it is simply too frustrating to die over and over. Alien Syndrome is a very interesting game which will take the best of games players to complete, a huge challange awaits those who would dare pick up a copy. I urge you to give it a go and once you do review this game on this site to let me know how you get on. I hope you all have as difficult a time as I had. Yet even after all this, because this is the game I purchased my Sega for, there will always be a little place in my heart for it. This is Dean, earth command trooper signing off.